Cabins are included with the fees as well as access to the gym, pool, spa, and other amenities. Prices vary by cabin. All meals aboard the ship are included. Alcoholic beverages and items from the snack bars are not included. Enjoy lectures from former faculty and alumni, SAS traditions like the crew talent show, and more! Dance the night away with Semester at Sea as we ring in 2019! All meals (excluding alcoholic beverages), lodging, programming, taxes, and passage fare. Prices are listed for single and double occupancy. There are a limited number of triples on the ship and we would like to reserve them for groups of three traveling together. There is one price listed for the cabin, and it will be split evenly in three ways between the guests. 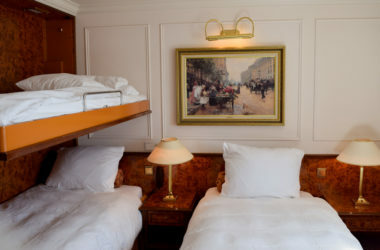 In the case of deck 8 cabins with capacity for up to four guests, the first two occupants will be charged the double occupancy rate; the third and fourth person will be charged $300 each. Dependents under 18 years of age sharing a cabin with at least one adult passenger will not be charged. The adult passenger(s) will be charged the full cabin rate. 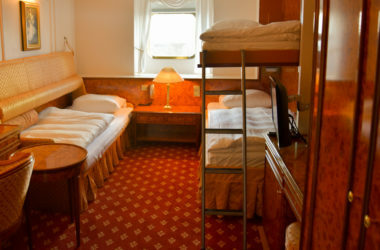 Children may stay in their own cabin if they are over the age of 10, but will be charged the standard cabin rates. In order to comply with the Federal Maritime Commission, passage fare will not be charged or collected until Tuesday, January 1, 2019, once the voyage has returned to San Diego. Each guest will be required to register a valid credit card on the World Odyssey at the start of the Homecoming Voyage. The credit card you provide to the ship at the beginning of the voyage for your on-board purchases will be used to pay for your passage fare. ISE will not match random roommates. All passengers traveling alone will pay the single occupancy rate for their desired cabin category. Questions? Call 800.854.0195 or email homecoming@isevoyages.org for more information. There is no penalty if you cancel by November 15, 2018. Cancellations made between November 16 and December 1 will incur a $200 fee. Cancellations made after December 1 will incur a $500 fee. The first price listed below is for full occupancy or what it will cost to reserve the cabin. 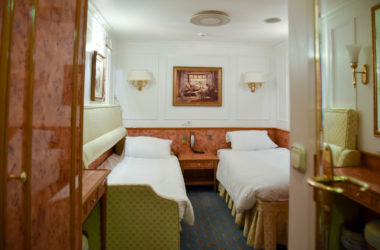 If you are traveling with someone in your cabin, you will each pay the second rate listed, the double occupancy price. If you are traveling alone, you will pay the full occupancy cost, or single rate. For example, if you would like to reserve a Deck 5 Outside Double with a companion, the cost for each person will be $900. If you would like to reserve that room for yourself only, the cost will be $1,800. *Third and fourth guests will be an additional $300 per person. **Third and fourth guests will be an additional $300 per person. **Economy Cabins are less luxurious than our other cabins, making these more affordable for those traveling on a budget. Questions about cabins and rates? Call 800.854.0195 or email homecoming@isevoyages.org for more information.